Looking for a big bank alternative for checking, savings, insurance, and more? Learn more about VyStar Credit Union in our review and see if it’s right for you. Traditional banks seem like a necessary evil for many of us. We need somewhere safe and secure to keep our hard-earned money. But many banking customers complain of long lines, poor service, lower rates on savings and rising fees on debt. These problems with the banking industry only seem to get worse each year. There is a great alternative to banks that many people don't stop to consider—credit unions! Consumers are often wary of credit unions due to their smaller size. However, your money is almost always just as safe with a credit union as with a bank. Credit unions have many benefits including better interest rates, and lower balance requirements. Be aware though, that they can have narrow membership requirements and less polished technology than the big banks. Of course, you want to make sure the company is reputable and offers an excellent service before you sign up. We dug deep to find out how VyStar compares to its competitors in all areas. With this comprehensive knowledge, you can be well-informed to decide your next step. Initially called Jax Navy Federal Credit Union, the credit union was formed in 1952. The 12 founding members from the Naval Air Station Jacksonville wanted to provide both military and civil service personnel, and their families, with a reliable and safe way to borrow and save money. After only one year, 1,100 members had already joined the union. Today VyStar has over 450,000 members. 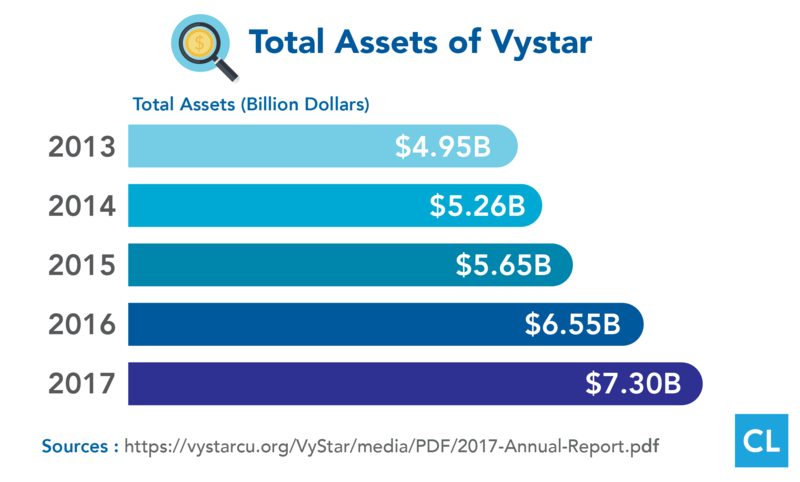 VyStar is a Federally Insured State Chartered Credit Union with 33 branches and $6.88 billion in assets as of June 30, 2017. The organization has 1,244 full-time employees and ranks as the 2nd largest credit union in the state of Florida, and 17th largest nationwide. Membership is open to residents, businesses, organizations, associations, and churches who live, work, or operate in 49 Florida counties as well as 4 counties in Georgia. You can see the full list here. Family members of current credit union members also qualify regardless of where they currently live. To be considered a family member, you must be related to the existing member by blood, marriage, or adoption. Interestingly, VyStar currently has members who live all over the world. This includes a full range of deposit and loan services for both consumers and businesses, with a wide range of credit scores eligible for approval. VyStar branches offer bilingual service in both English and Spanish. Checking – free accounts include debit cards, no minimum balance requirements, and no monthly fees. All VyStar checking accounts pay interest. Vehicle loansand insurance – cars, trucks, boats, jet skis, RVs, motorcycles, ATVs, and scooters are all covered. Credit cards, prepaid cards, and personal loans – Vystar's offers include no annual fee and low interest. Business services – including shared accounts, business loans, and mortgage processing. VyStar also offers POS solutions that allow businesses to accept credit and debit cards, as well as complete payroll. Home equity and mortgages – a full range of adjustable and fixed-rate mortgages with a wide variety of terms. VCU offers competitive rates, and the escrow pays interest. Financial counseling services – available by phone and free of charge. VyStar's BALANCE counseling and education program helps educate customers on big financial decisions. These include buying your first home, preventing mortgage delinquencies, and foreclosures. Other service offerings include teaching how to save, and general money management. Investments – including many types of savings and CDs. VyStar's financial advisors help you analyze your financial situation. This is a no-cost service designed to help you hit your financial milestones. They will also help you develop your own tailored investment plan. This can include funding education for your children, and planning for retirement. Health savings account – Save money for health care costs while taking advantage of tax savings. Internet Banking – access your account via a web browser or mobile app that allows you to web bill pay, check balances, transfer money and more. Free ATM withdrawals – VyStar has more than 200 of their own ATMs and 39 ATMs in Walgreens stores that are free for members to use. You also get access to thousands of network ATMs worldwide. As a member, you can take advantage of lower balance requirements and fees on your VyStar accounts, as well as better rates on investments. VyStar's overall CD rates are 39% higher than the national average, including a 2.65% rate on a 60 month (5-year) CD. The most significant drawback to being a VyStar member is the lack of physical locations. Their branches are restricted to only the Northeast Florida region. If you move out of this area or need to visit a branch while traveling, you may be out of luck. 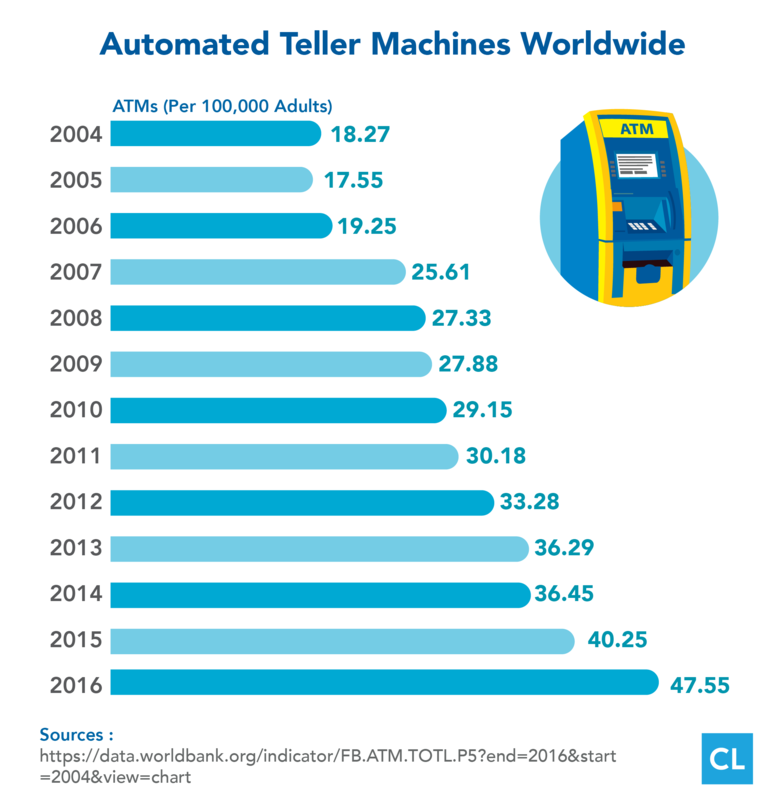 Compared to major banks, their number of ATMs where you can make free withdrawals is also limited. VyStar's interest earned on savings and checking accounts is a little below the average for credit unions, with a 0.25% rate and 0.10% rate respectively. NSF fees are also a bit high at $32, but if you don't bounce checks that shouldn't be a concern. Fees, including those for ATM withdrawals and wire transfers. Interest rates on both loans and savings. Minimum balance requirements for checking and savings accounts. Vystar's financial calculators can show how loans are impacted by different interest rates, and terms. A valid email address. Any active email address that you can access will work. A valid picture ID. Options include a scanned copy of your passport with a photo, a current/valid U.S. Driver's license, or U.S. State ID. Your personal information. This includes your date of birth, address, and phone number—your employment information, and Social Security number will also be required. The personal information of anyone else on the account. This means you will need the address, date of birth, and Social Security number for anyone who will be listed as a joint account holder or beneficiary. Your current banking information. They will require the routing number and account number of any existing accounts you will use to fund your new VyStar account. To apply for a VyStar Loan, you must be a VyStar member. You can apply at a VyStar branch, online through Internet Banking, or by phone by calling 1 (800) 445-6289 option 3. Loan approvals are quick, and you will usually hear back the same day you contact VyStar. Your VyStar member number. You must already be an active member in order to apply for a loan. Your loan request details. This means you need to know the amount you want to borrow, and length of time you want to finance your loan. Employment information. Your current employer name and contact information, and current income are all required. Contact information. This includes your address, phone number, and email. Any co-applicant personal information. You will need their full name, address, and Social Security number. Previous employer information. Thisis required if the length of current employment is less than two years. Current creditors, for a debt consolidation loan. You will need to provide the name of creditors to be consolidated as well as the amount owing to each one. Collateral information. For refinance and individual sale requests, the year, make, and model of collateral such as a vehicle, boat, etc. Is VCU available in all states in the US? Only specific counties in Florida have physical branches. However, if you have a family member who is already a member, you can join no matter where in the world you live. Do I need a checking account to apply for a loan or credit card with VCU? Yes, you must be a VyStar member to apply for a loan or credit card. The same products and services are offered through Internet Banking no matter where you live. Does VCU use credit scores to determine if you qualify for a loan or credit card? Loans are subject to a credit approval process similar to other financial institutions. Does VCU report to any of the credit bureaus? VyStar works with all three top credit bureaus (Experian, TransUnion, and Equifax). They also work with the bureaus to provide their FraudScout© Fraud and Credit Monitoring Service, for an additional fee. VyStar currently has 33 physical branches in the Northeast Florida area. What is the overdraft protection offered for checking accounts? All VyStar checking accounts are automatically enrolled in overdraft protection. However, you do have the option to opt out. You can also provide your own overdraft protection by using an unsecured line of credit. How are the reviews of VCU? VyStar Credit Union has a score of 4 out of 5 stars or more on most review sites. For example, wallethub.com rates VyStar 4.2 out of 5, with 73% of users giving it a 5-star rating. Is there a rewards program associated with VyStar's credit cards? Yes, with rewards depending on the card plan selected. You can choose from reward points or cash back equivalent to 3% on gas, 2% on groceries, and 1% on all other purchases. Reward points can be redeemed by logging into your Internet Banking account and accessing the UChoose Rewards page. There are thousands of rewards to choose from. These include high-definition TVs, airline tickets, and cruises. How VCU offer credit score reports each month? Yes, for an additional monthly or annual fee. Can I withdraw money from any ATM using my VCU card? There is an additional fee when not using a VyStar or Walgreens ATM. Are the rates offered by VCU competitive compared to other banks? VCU rates are competitive with other banks and credit unions on all of their financial services and products. Is VCU insured by NCUA or FDIC? Member deposits are insured up to $250,000 by the NCUA under the NCUSIF (National Credit Union Share Insurance Fund). The NCUA offers a similar level of deposit insurance protection to that of the FDIC. If I have a savings account with VCU, do I also become a part owner? A credit union is owned by its members, as opposed to shareholders. What are some of the ways that VCU gives back to the community? VyStar partners with high schools to teach business management and financial services. Baker and Clay County Fairs. VCU has been providing financial services for over 60 years and has all the requirements necessary to ensure your money is kept safe and secure. The most significant drawback of banking with VCU or any credit union is their geographic limitations. They simply can't compete with a major bank with nationwide branches. As long as this isn't a dealbreaker for you, VCU offers a great alternative to regular banks including lower fees and better rates. How has the company worked for you?